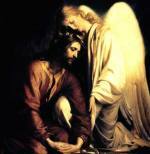 The first Sorrowful Mystery of the Rosary, the Agony in the Garden commemorates our Lord’s struggle to keep His composure at Gethsemane as His Passion drew near. That night His Humanity was sorely tested to fulfill his mission in His Divinity to die on a cross so that we might have Eternal Life. We read in the Gospels of how he asked His Father three times to let this bitter cup of sorrow pass from Him, while, saying “but yet not my will but thine be done” (Lk 22:42) in loving, self-sacrificing obedience. Yet Scripture doesn’t reveal too much about Jesus’ emotional turmoil that night in the Garden before His arrest, show trial, and execution. He tells the apostles Peter, James and John as they approach Gethsemane that “my soul is sorrowful, even unto death” (Matt 26:38). Nonetheless there is one heart-rending and intriguing detail St. Luke gives us! When I reflect on Christ’s Agony in the Garden in the Rosary, the question often comes to my mind: what could make God sweat blood? 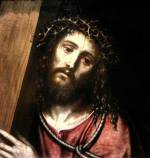 Church approved private revelations can shed some light as to the horrible nature of Jesus’ suffering at that moment! 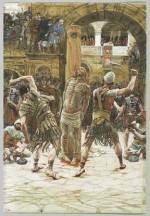 It wasn’t enough that He could foresee in great bloody detail his being scourged, mocked, and crucified the next day. There was something even worse than that: the thought that His redemptive suffering would be in vain for many ungrateful souls throughout the ages to come! While His death would open up the gates of heaven it would be up to each of us to choose to follow Him there and accept His offer of salvation in how we live our lives. Yet many souls would be lost over the centuries to come, as people would reject Him through unrepentant attachment to their sins! Those of you who have seen Mel Gibson’s classic film The Passion of the Christ may well remember that chilling opening scene where Jesus is indeed praying to His Father, but in a bloody sweat, like that described in Luke’s Gospel above. The 19th century German Mystic Blessed Anne Catherine Emmerich had numerous visions of Christ, some of which were transcribed by the poet Clemens Brentano for the book The Dolorous Passion of Our Lord Jesus Christ. It goes into harrowing detail about exactly what horrors our Lord Himself saw during his Agony in the Garden: centuries’ worth of truly frightening visions of all the sins of the world, along with much heartbreaking apostasy from His true Church. In her visions we see Jesus overwhelmed by visions of humanity’s sins, as well by as the ingratitude of so many of those for whom He would be crucified! "He [Jesus] was trembling all over when he entered the grotto to pray…Alas! This small cavern appeared to contain the awful picture of all the sins which had been, or were to be, committed from the fall of Adam to the end of the world…He fell on his face, overwhelmed with unspeakable sorrow, and all the sins of the world displayed themselves before him, under countless forms and in all their real deformity. He took them all upon himself, and in his prayer offered his own adorable Person to the justice of his Heavenly Father, in payment for so awful a debt….I saw all the sins, wickedness, vices, and ingratitude of mankind torturing and crushing him to the earth." And indeed, Our Lord Himself affirmed Bishop Sheen’s words in riveting detail to another mystic Sister Josefa Menendez in the 1920’s, as related in the book Christ’s Appeal for Love. Thus, in that brief hour or two, Jesus somehow saw the next 2000 years of everyone’s sins, including yours and mine, as both Sister Emmerich and the great Theologian and Doctor of the Church Saint Alphonsus Liquori have grieviously observed. In seeing all the strife and bloodshed to come Jesus well understood that, as the learned Simeon had observed shortly after His birth, He would be a sign that would be contradicted (Lk 2:34). Jesus Himself said in the Gospels that many conflicts, even among families would occur in His name (Matt 10:34, Lk 12:52). Indeed, there have been many horrible verbal and physical clashes over Christ, His divinity, and the nature of His church over the past 2000 years! Jesus saw it all in great detail! Witnessing even one murder or other such act of violence can traumatize any of us. We read often of soldiers surviving the slaughterhouse of war struggling with PTSD or other emotional disturbances. Imagine our Lord seeing so much hatred, coldness, and bloodshed combined, two millennia of Hell on Earth quite present before Him for about 2 hours!!! Indeed, as our Lord foresaw that night, the Catholic Church has often been scourged over the centuries both by enemies from within its ranks as well as from those without! Don’t forget it was an Augustinian monk, Martin Luther, whose attempts at reform precipitated the massive fragmentation of Christianity and misrepresentation of traditional Church teaching that followed. In another more recent example, Pope Paul VI lamented in 1972 that the smoke of Satan had entered the Vatican. And we’re still cleaning up various messes around the world from the priests’ scandals uncovered by the laity! And yet, our Lord predicted the gates of Hell would not prevail against His church (Mt 16:18). Amen to that! It has been said that God sees all human history as a panorama, as He exists outside of our conception of time, in an Eternal Now, seeing human events at a glance. Granted this is hard for us to comprehend but it raises a good question: In that panorama, does he see you and shed blood, sweat and tears? Or does He feel some strength and comfort that His passion wasn’t in vain for you?! This to me is the great challenge of this event, to fulfill our calling to be among that number of saints in this heartbreaking mystery! It has been said that Christ gave up His life so that each and every one of us could be saved, and that includes me and you! An important part of becoming a saint is living with Christ in you, and you in Him, through prayer, participating in His sacraments of the Eucharist and Penance, and striving to live as Christ-like as you can by showing His love, patience, and compassion in how you treat others. We are all called to give glory to God in our lives, even in the everyday things we do that can nonetheless show Him our love! As we meditate in a very special way on our Lord’s Passion, let us all try to be among those people whose lives of love and obedience to His commandments gave our Lord consolation and renewed vigor in the midst of all those bleak and bloody images from the future. I pray that Jesus can somehow have seen each of one of us in that consoling vision, thinking “at least my suffering will not be in vain for them. They’ll honor My sacrifice with their love. At least they get it” And may we all thus be able to join Him in paradise one day! Pray that you can give Christ some comfort and strength, in the midst of the sins of fallen humanity as well as your own trials and tribulations. Pray that His blood sweat at Gesthemane and shed at Calvary may not have been in vain for you and others, both the good and the bad. May none of us be lost in Hell, but rather experience God’s loving eternal embrace in heaven, our true home, where there are no tears!